I want to pose a hypothetical to you. Suppose you’re an attorney specializing in contract law. How many competitors do you have out there? And suppose you speak and write fluent Mandarin. Not so many. You’ve radically reduced the pool of candidates someone needing those two skills can hire. By virtue of possessing that additional language skill, you just made yourself far more appealing to certain prospective clients and cut a whole lot of your would-be competitors out of the running. I tell young people all the time, if you want to stand out and essentially write your own ticket in life, combine specialties that very few people possess in combination, but that are solely needed in certain niches. Combine a couple of specialties that will attract the kind of business you want and the competition in that niche melts away. Case in point: My husband and I love wine. We love to taste new wines, buy wine, collect wine, and learn about pairing food with wine. We especially love to go to wineries in search of new favorites. The good news is we live in Oregon where there are over 400 wineries, so we do a lot of wine tasting on the weekends. It’s one of our favorite pastimes, something we look forward to doing … not only because we love wine, but also because it’s time we get to spend together away from the hectic work week life. But whaddya do when you’ve just gotten a new puppy you can’t leave alone? 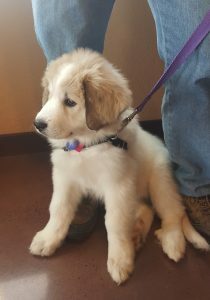 She’s adorable … a Great Pyrenees … fluffy, cute, big … and on her way to getting a lot bigger. But because she’s a puppy, we’re caught up in typical puppy stuff … housebreaking, crate training, obedience, etc., and she’s only 11 weeks, so we can’t yet leave her by herself. So, we take her everywhere we go. How do we go wine tasting on the weekends with a puppy in tow? Hmmm … we didn’t think about that when we got her. Go on the internet and see if there are any dog-friendly wineries in the area. Bingo. I found a couple dozen within an hour of us. Think about how smart these winery operators are. There are roughly 375 wineries that won’t be getting our business, at least for a while, because they failed to see the power in appealing to two overlapping market niches … wine-lovers and dog-lovers vs. just one. Would some people stay away from a winery that was dog-friendly? Some might, but probably not many. Would dog-friendly wineries get more business catering to folks out on the weekend with their pets? Absolutely. So they promote the fact that dogs are welcome on their websites and hold special dog-related promotions. Some have named wine clubs for their members with dogs. “Pinot & Pups” is one of my favorites. Members of that club are treated to free wine tastings and a biscuit for pup. And their wine shipments include treats for Fido. Not only are dogs allowed, they’re encouraged. That’s just smart marketing … and you don’t even have to learn Chinese to get a leg up on your competition. So, time to do some strategizing and figure out how you might be able to apply this idea to your business and multiply your appeal. And please, let me know what you come up with.